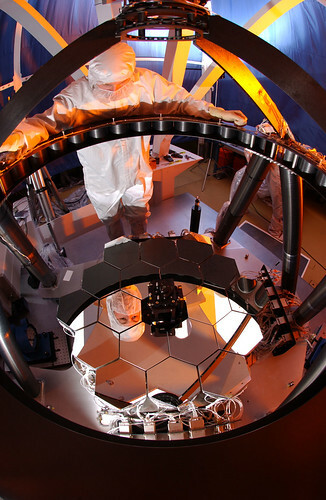 The James Webb Space Telescope has an 18-segment, 6.5 meter-diameter primary mirror, which is so large it has to fold to fit into the launch vehicle. After launch, the telescope will deploy on its way out to its final orbit. Wavefront sensing and control is a technical term used to describe the subsystem that is required to sense and correct any errors in the telescope's optics. This is especially necessary because all 18 segments have to work together as a single giant mirror. 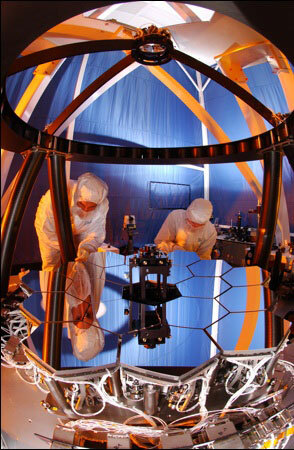 Ball Aerospace engineered a scaled telescope testbed to develop and demonstrate this technology. An image of the testbed telescope is shown at right. 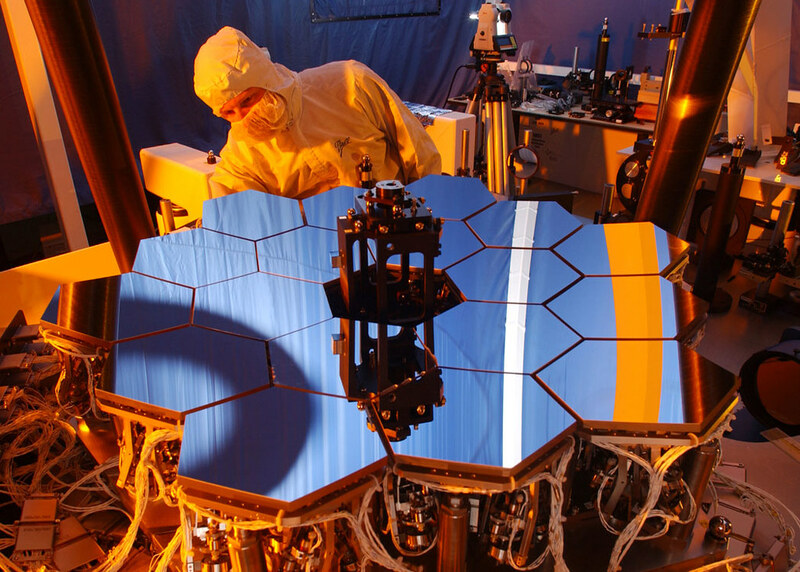 Each of the 9 distinct alignment processes - the algorithms - needed to align the deployed 18-mirrored telescope into a high-performance single-mirrored telescope were designed and demonstrated on the testbed. The work performed on the telescope optics resulted in a NASA tech spinoff for diagnosing eye conditions and accurate mapping of the eye. This spinoff supports research in cataracts, keratoconus (an eye condition that causes reduced vision), and eye movement - and improvements in the LASIK procedure. For more technical information on the wavefront sensing and control testing process, please view the article in Newsletter #2. A few additional photos of the testbed follow. Shows the scaled telescope testbed for wavefront sensing and control testing.